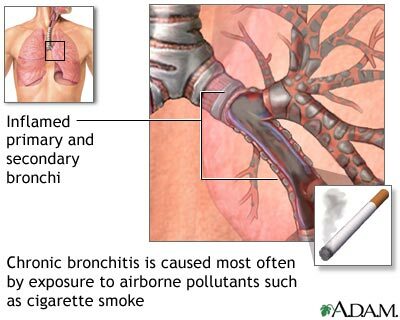 Chronic bronchitis is most frequently caused by long term irritation of the bronchial tubes. Bronchitis is considered to be chronic if symptoms continue for three months or longer. Bronchitis caused by allergies can also be classified as chronic bronchitis. Chronic bronchitis is caused most often by exposure to airborne pollutants such as cigarette smoke, excessive dust in the air, or chemicals. The bronchial lining becomes inflamed and the constant exposure to such pollutants begins to cause damage in the bronchioles (the smaller airways in the lungs). Symptoms of chronic bronchitis include shortness of breath or wheezing, chest pain, and chronic productive cough.